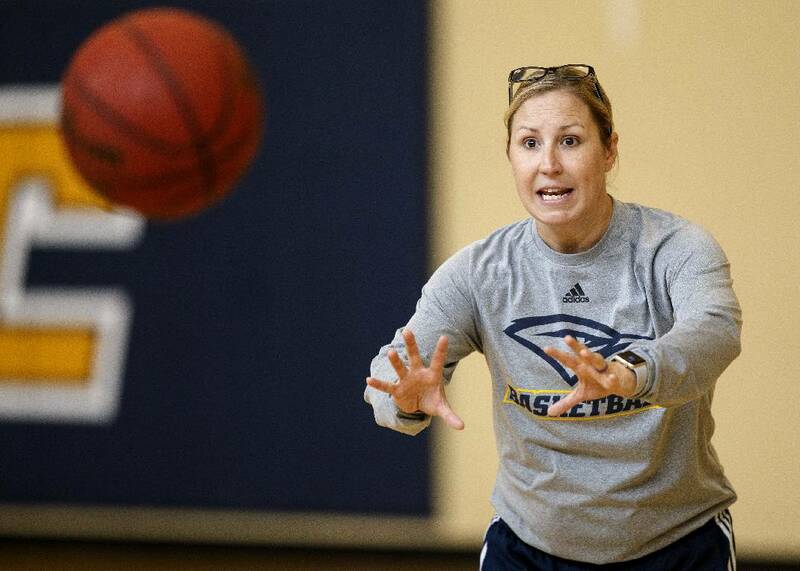 Head coach Katie Burrows goes over a drill during practice at the Chattem Basketball Practice Facility on the campus of the University of Tennessee at Chattanooga on Thursday, Sept. 27, 2018, in Chattanooga, Tenn.
During a recent practice, the University of Tennessee at Chattanooga women's basketball team had a good moment. One worth celebrating, which they briefly did. New head coach Katie Burrows stopped practice and brought the players together. Only it wasn't to scold them. "She told us, 'I'm going to get hyped, so I want y'all to get hyped,'" senior guard-forward Shelbie Davenport said. "It got us out of our shell, and we saw her get out of her shell, so we have more fun now. It's open; you can see it in practice. "We celebrate anything, and the coaches feed off it." It was at that moment that for some the realization hit that this was a new era. Burrows — a Mocs assistant for the past eight seasons — was the replacement for Hall of Fame coach Jim Foster, who spent the final five of his 40 seasons coaching at UTC. Foster was more stoic in nature, choosing to observe and not say much, but Burrows has been hands-on in her approach with her first team. Multiple players have described a high energy level at practices through the first two official weeks. The team did have some on-court time during the summer and preseason to work, so it wasn't as though the returning players were blindsided by Burrows' style, a more energetic one that starts from the moment practice starts. "I think we all knew it would be a little different, but we weren't really sure exactly what," senior guard Molly Melton said. "She didn't rewrite the system, but it's definitely a little different. There's a lot more up and down, up-tempo, high-energy stuff." There won't be a ton of change in the system once games start. Maybe a little more pressure, maybe a few tweaks to the offense. Burrows said she's trying to give the players a little freedom and letting them have some fun, while still being able to reel it in when necessary. "They're taking everything we're doing very well," she said. "We're keeping it simple — nothing fancy. They're enjoying it from that respect, and it's been very fun to watch. I've had to tame them a little bit, but I gave them some freedom to see where they were with me and how they would act with me. "We're not having to coach effort, which is exciting. They've been bringing it pretty much every day, which has been amazing."